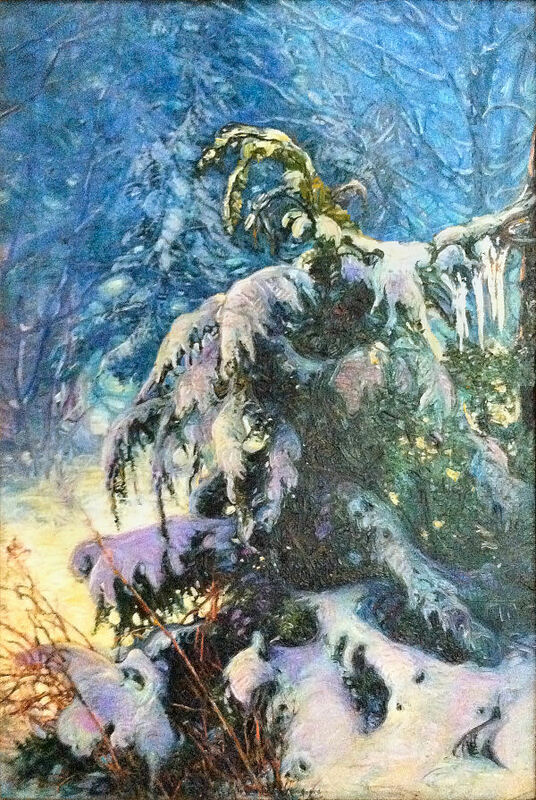 RSW- Artwork page, "Small Hemlock in Snow"
This piece is a new find (as of May 2012) and a previously unknown painting from RSW's early years. 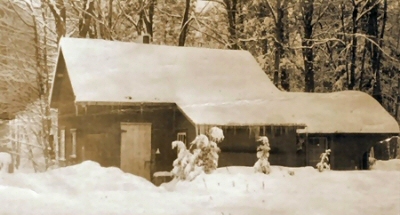 A picture of the Redgate Studio with small hemlocks in snow. To the right: A picture of RSW's first studio he called Redgate. As you can see, there are a row of small hemlock trees lining the front. 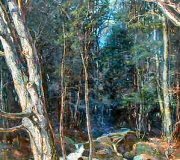 One of these hemlocks was probably the subject of this oil painting. Below: An image of the name on the back of the stretcher. This piece was a previously unknown painting from RSW's early years. 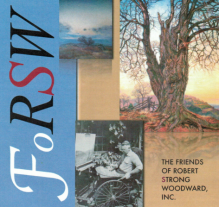 It is so quintessential to RSW's early Redgate paintings (in that behind the studio "woodsy" look) the website staff felt pretty certain it was a Woodward even before receiving a photograph of his signature as confirmation. It is also why we put so much work into this website. The current owner had tried years ago to find some sort of information on the artist, to no avail and just recently decided to try again and found us! Their graciousness in providing us the images used on this page are greatly appreciated. Thank You! "It is the unanimous concensus of our website staff that your painting is definitely a work of Robert Strong Woodward. 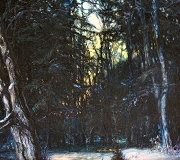 It was likely painted while he was in his first studio called Redgate, probably painted out the rear window of this studio looking into the woods, and was probably painted in about 1919 or 20. It is definitely an early work. 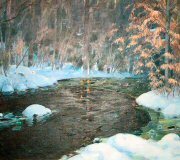 His complete diary of paintings was not written by him until starting in the 1930s and he had probably forgotten about this one when recording his diary. 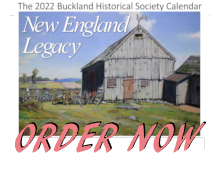 Anyway we are satisfied that the signature is authentic, the title is characteristic of his titles, the painting style is consistent with others painted in that time frame."